Not All Moonshine! : Book Review - Best. Generation. Ever. Book Review - Best. Generation. Ever. It is with a lot of admiration that I present today's book review. The author is a young boy of only seventeen, and this is his first ebook. 'Best. Generation. Ever.' is a collection of Aditya's essays on various topics that are relevant to the youth of this millennium. The entire book is written in first person and is divided into eleven chapters. The first essay is on Internet and how today's generation is embracing the IT sector. In the second chapter, the monologue drifts to politics and the need for young blood in public administration. Somewhere in the middle of the discourse, Aditya emphasizes the importance of communication skills and touches upon the issues of brain drain and unemployment. He further expounds on the inspiring efforts of young entrepreneurs and the attitudes of the corporate world in the present age. 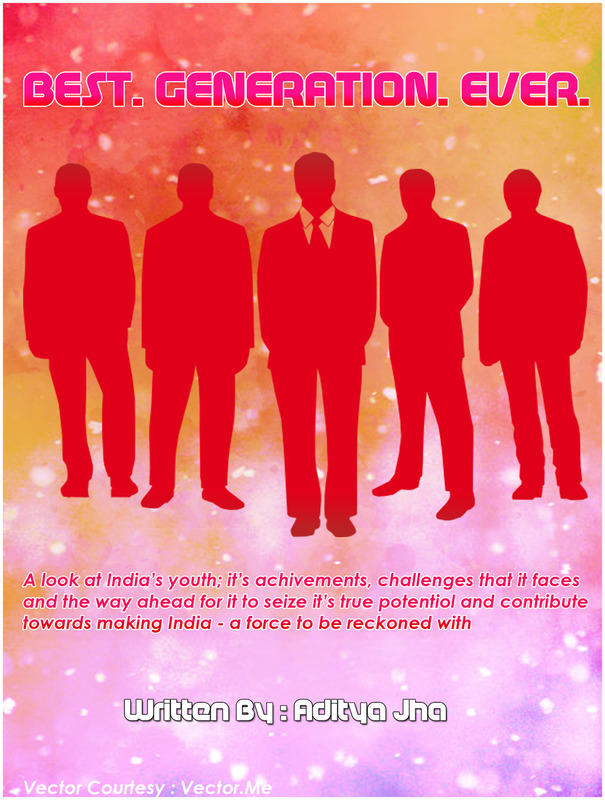 Towards the end of the book, the focus tilts towards the initiatives needed to develop the youth of India. A discussion on Indian education and sports draws the set of essays to an end. The book transitions smoothly from one chapter to another. There are some gaping grammatical and spelling mistakes throughout the ebook which call for a round of good editing. The thought behind every essay, however, remains very lucid and mature. It is evident from the statistics and sources quoted across the book that the author has put in a decent amount of research and has checked his numbers before stating them. The book bears no page numbers and makes for a very quick read. (I finished this in under 90 minutes while I was at work ;-) ). Aditya Jha impresses me not for his style or language but for his maturity of thought. This school boy puts in a good amount of effort to clearly express his views on a lot of issues that affect the youth of our country. He backs most observations with data from newspapers. I feel, he can cover a few other topics too - health, for example. Another observation is that most of the views expressed are generic and slightly cliched. For a boy who hasn't yet reached adulthood, I would have liked to hear some unique ideas and thoughts that only his generation can think of. Best. Generation. Ever. gets a strong rating of 6 on 10 from me for the hard work and articulate exposition. I wish Aditya all the best for his future! I would love to read more books from this budding author. Zenfone - My Ideal Valentine!